This is the back story to the book Moving Forward Faster. After finishing Volume Six, the last volume of REAL LEAN series, I reflected back on what I had done. The books were written for busy managers. They were short in length and the chapters could be read à la carte. But, at about 1200 total pages, it is unlikely that busy managers would read all six volumes – despite the many helpful things that they could learn. What was the message I was trying to deliver? Fundamentally, the REAL LEAN books said that most Lean transformations were proceeding badly and too slowly, in part because people, especially leaders, did not possess the correct “basic way of thinking” (my sensei always stressed the importance of understanding the “basic way of thinking” about Lean). The chapters touched upon many different aspects, but the overarching themes were economic, social, political, and historical. I realized that these themes would be a nice way to summarize the what the REAL LEAN series was saying. That’s how the idea for Moving Forward Faster came about. But, I wanted to present the information differently. I wanted it to be direct and succinct compared to the long form narrative I had always used to write books. I went through each page of REAL Lean and identified the individual factors that caused Lean transformations to proceed badly and move too slowly. There were 24 economic factors, 21 social factors, 18 political factors, and 21 historical factors. Eighty-four things existed in the minds of leaders that were inconsistent with the “basic way of thinking” about Lean and which, in turn, lead to Fake Lean. 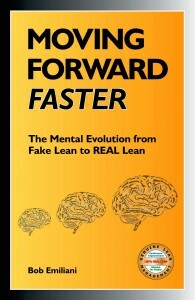 Published in 2011, Moving Forward Faster: The Mental Evolution from Fake Lean to REAL Lean presents the four themes using a color code: green for economic, blue for social, red for political, and brown for historical. I then explain each of the 84 factors in bulletized lists of short sentences. The benefit of presenting the information this way is that it makes a rapid, clear connection to the lack of Lean management success – or, conversely, how to succeed with Lean management much more quickly. Moving Forward Faster is 102 pages, but the key information on how to move forward faster is presented in the first 44 pages (pages 10-55). I recommend using the book to diagnose and correct Lean transformation problems in your organization. Nearly every executive says that their biggest regret in any type of organizational transformation is not having moved more quickly. Moving Forward Faster will leaders avoid that regret.